Seattle couldn’t keep the lead in the ninth, then let the Chicago White Sox take it in the 10th, resulting in a 6-3 loss for the Mariners. Carson Smith couldn’t keep the lead in the ninth. Danny Farquhar allowed the White Sox to take the lead in the 10th. And the Mariners couldn’t rally in their final at-bat to undo the mess. The names of the relievers change. The opponents are different. The situations can vary. Yet, the failure is still the same. Seattle’s 6-3 loss in 10 innings to the White Sox on Saturday night was like so many before — a wasted effort. The Mariners’ bullpen — a dumpster fire for far too much of the 2015 season — gave away yet another game with lack of execution. And finally, changes were made. Following the loss, former All-Star closer Fernando Rodney was designated for assignment and Farquhar was optioned back to Class AAA Tacoma for the third time this season. The Mariners will recall left-hander Roenis Elias from Tacoma and purchase the contract of veteran right-hander Logan Kensing for Sunday’s series finale at Safeco Field. Rodney wasn’t part of the debacle against the White Sox on Saturday, but he contributed to the loss on Friday and to plenty of others this season. Rodney’s struggles had left some scars. He was 5-5 this season with a 5.68 ERA in 54 appearances. He’d blown six saves, lost his closer’s job by June and became an unreliable setup man the rest of the way. Many Mariners fans believed the moment should have come a month or two ago. It was a move pushed for by people in the team’s baseball operations and the field staff, including McClendon. But, as with Chone Figgins in 2011 and 2012, the powers that be were hesitant to make the move until they were left with no other choice. It was a rapid fall for Rodney, a reminder of the fragile success closers operate with. He was an All-Star last season and led all of baseball with 48 saves. It was a Mariners record for one season. The saves weren’t always pretty or easy, but they were made. This year, he had no command, gave up big hits and was a liability on far too many occasions. But it was “funny” as in strange, not amusing. Because the Mariners’ bullpen elicits few laughs. Smith falls into that category. In his first full season at the big-league level, he’s been handed a closer’s job. He’s had some brilliant moments, but lately it’s been a struggle. He now has four blown saves this season, and in his last 12 outings, he has an ERA of 8.49. Smith came in with a 3-1 lead and gave up two runs. A leadoff single and a walk put him in immediate trouble and led to an RBI single from Alexei Ramirez and a run on a fielder’s choice to tie the game. But Seattle’s 20th extra-inning affair wouldn’t last long. Farquhar was charged with all three runs scored in the top of the 10th inning to take the loss. It included a leadoff walk, a double to Jose Abreu, an intentional walk to load the bases and an unintentional walk to force in the go-ahead run. 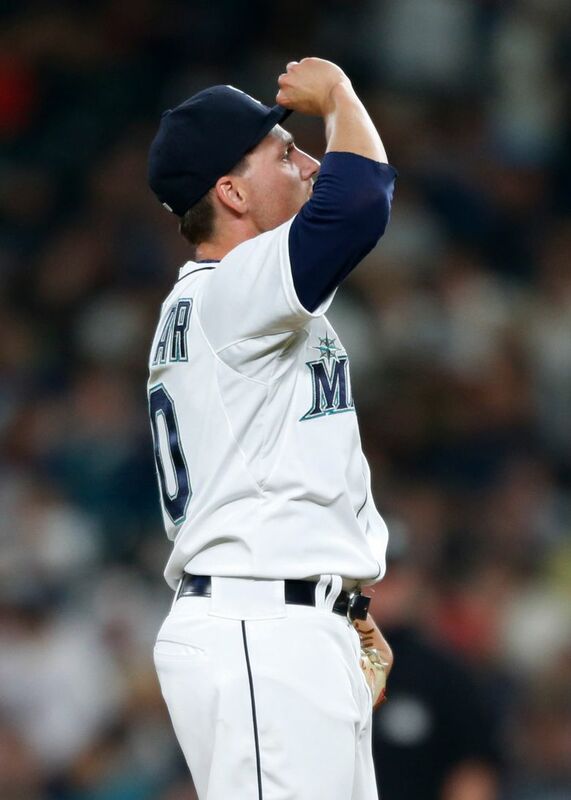 Farquhar’s other two runs were scored on a passed ball by catcher Mike Zunino and a failed inning-ending double play, which was needed after Robinson Cano’s error on a ground ball. With most of the crowd of 32,085 shuffling out, the Mariners gave the remaining fans no reason to cheer in the bottom of the inning, going down in order to end the game. It torpedoed a solid outing from starter Vidal Nuno. The left-hander pitched 62/3 innings, giving up one run on five hits with a walk and four strikeouts. Nuno’s only real mistake came in the second inning. White Sox rookie Trayce Thompson, the younger brother of NBA star Klay Thompson, turned on a fastball, yanking a line drive over the left-field wall. The Mariners’ three runs came in the sixth inning against White Sox starter Carlos Rodon. Nelson Cruz led off with a double to center and Cano reached on an error by Sanchez at second. Franklin Gutierrez continued his career renaissance by scoring both runners with yet another clutch hit against a left-handed pitcher. Gutierrez jumped on a 1-1 fastball from Rodon, lining it into the gap in left-center, scoring Cruz and Cano to give Seattle a 2-1 lead. The Mariners tacked on another run in the inning when Gutierrez scored on a double play off the bat of Jesus Montero. Right-hander Tom Wilhelmsen replaced Nuno in the seventh and didn’t allow a run. He pitched a 1-2-3 eighth inning to set up Smith for the save.